“Ernest William Peacock (c1896-1970),” Wyndham History, accessed April 20, 2019, http://wyndhamhistory.net.au/items/show/2465. The family resided in the Laverton area in Melbourne, Victoria. On enlistment, 19-year-old Ernest was working as an apprentice cycle mechanic. He was described as 5 ft 6 ½ inches in height, weighing 10 stone, 3 lbs. He was of medium complexion with brown eyes and brown hair. At time of enlistment, Ernest was single and of the Presbyterian Faith. Ernest was assigned to the Australian Imperial Force and was initially part of the 22nd Battalion, C Company, where his rank was a Private. Ernest later rose to rank of Driver. The 22nd Battalion was formed on 26 March 1915 at Broadmeadows, Victoria. Most of the battalion, including Ernest, embarked for Egypt on 8 May 1915. The unit embarked from Melbourne, Victoria, on board HMAT A38 Ulysses, although, some sources list date of embarkation as 10 May. From Egypt, the battalion was deployed to Gallipoli in September of that year and served on the peninsula until December of 1915. The unit was then brought back to Egypt to regain strength with an influx of new soldiers. 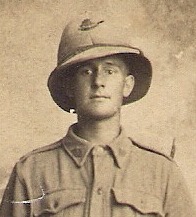 During his time in Gallipoli, Ernest served as a machine gunner. In March 1916, the battalion embarked for France. Here, they took part in their first service on the Western Front in April 1916. The effort at Pozieres was the battalion's first major action. It was part of the British offensive on the Somme. Come September they were moved to the Ypres sector and back to Somme during the winter months. Ernest returned to Australia on the HJ Mahia which embarked on 4 June, 1919. He was discharged from service on 15 September of 1919. After the war, Ernest resided in the Footscray area until around the time of his death on 26 December 1970. Ernest died in Heidelberg, Victoria (possibly at the Repatriation General Hospital) and is buried at Altona Memorial Park. He was survived by at least one son, Norman Ernest William Peacock. His marital status and other children are unknown.